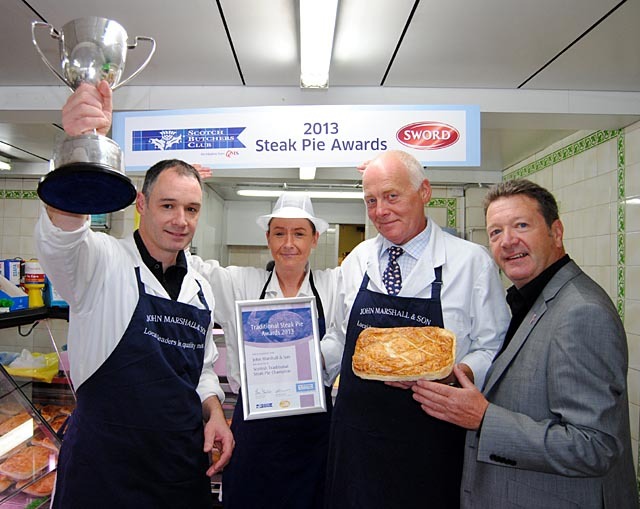 A Johnstone butcher’s steak pies have been judged the best in Scotland. 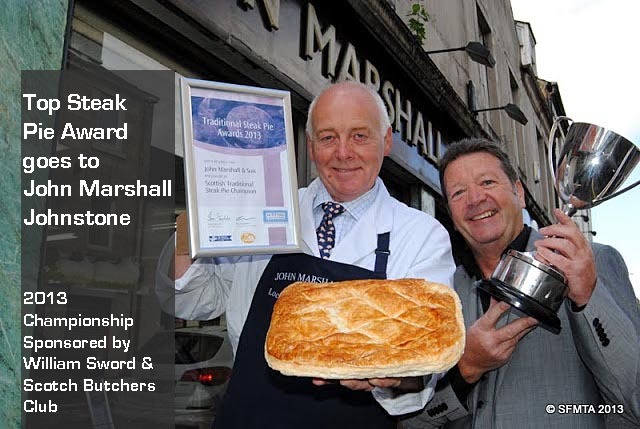 John Marshall & Son, 65 High Street have won the title Scottish Champion in the 2013 Scottish Craft Butchers Steak Pie Evaluation. The heats were held at Perth College last month to establish the five Regional champions from around Scotland . Marshall ’s pies won the accolade of West of Scotland champions taking them through (unknowingly) to the Scottish Final. More than 150 pies from throughout the country were tested for appearance, flavour, filling and appeal. The panel of judges included experts, cooks and interested consumers and the event was organised by the Scottish Federation of Meat Traders in conjunction with the Scotch Butchers Club and William Sword Ltd. The Regional winners were then mystery shopped and the overall winner was decided in the second tier of judging held at Drumpellier Golf Club. There the Club Secretary, Alex Stewart, Course Manager Brian Hillen and Head Chef, Jess Vigni made the decision on which of the five regional champions was worthy of the title Scottish Champion. Steak Pie is a firm favourite at golf clubs and decisions on venues for golf club outings are frequently based on the quality of steak pie that is served up at the chosen golf club. So this was a team of judges who were going to be taking the competition very seriously. They were most impressed with the standard of all the steak pies but decided unanimously on one winner. David Marshall and his piemaker John Kerr were delighted to learn of his pie’s success. David said:-“It was nice to find out that I had won the West of Scotland title but it was real elation at lifting the Scottish title. It is nice to get recognition for what is a very popular and important Scottish dish. Laurent Vernet, Head of Marketing with Quality Meat Scotland which runs the Scotch Butchers Club, sponsors of the Steak Pie Evaluation “Scotland’s beef is world-renowned thanks to its outstanding quality and exceptional taste. “It’s also an extremely versatile product which can be used to make fantastic modern recipes as well as high quality products such as steak pie.